I know that life moves fast and a lot of time you don’t have the time to whip up an elaborate dinner. Instead of ordering a pizza, try making your own flat bread one. It’s super easy. When I was in high school, I worked at a pizza restaurant. They used to let us make a small pizza to take home after our shift. We used to get creative with the toppings. I think I made a steak and cheese pizza once. On slow nights we used to make fried dough. It was fun and yummy. Probably not too healthy though. 🙂 Now, every time I smell takeout, it reminds me of that time. Take the whole grain flat bread and brush it with oil and bake it for about 7 minutes. 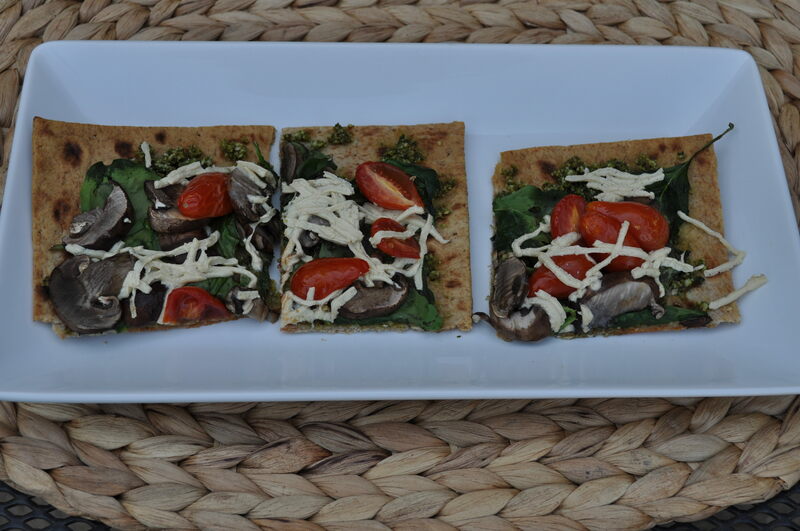 Pull the flat bread out and spread on the pesto sauce, add the mushrooms, spinach and tomato and cheese and bake for another 10 minutes or until the flat bread looks crispy. Do you have Any healthy homemade pizza dough recipes? Whenever I crave pizza I make it out of sliced zucchini instead of crust. Takes calorie count way way down and tastes delish! Just cut a small zucchini in half ( or if you have a big zucchini, just slice it thin enough so it cooks in a timely fashion ) and throw on your toppings. Bake on a foil-lined, olive oil drizzled cookie sheet, and bake at 375-400 until zucchini is as soft as you like it and the cheese is melted. I used a store bought one. I think it was Food for Life?